Towing capacity of up to 4,700 lbs. 4Runner offers two different 4-Wheel Drive systems: SR5 4WD and Trail models utilize part-time 4WD with Active Traction Control (A-TRAC), while Limited 4WD is equipped with a full-time 4WD system featuring A-TRAC and Torsen7reg;, limited-slip center differential with locking feature. The Kinetic Dynamic Suspension System (KDSS) and Crawl Control (CRAWL) are meant to help keep optimal traction, no matter how uneven the terrain is. KDSS automatically adjusts the suspension system for better wheel articulation, while CRAWL automatically modulates the throttle and brakes on five low-speed settings. 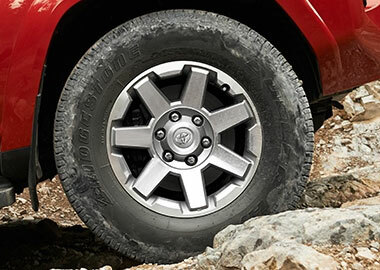 Multi-terrain Select allows you to choose from four modes that will help regulate wheelspin by adjusting the engine throttle setting and traction control to help provide you with maximum traction on various off-road situations..
4Runner’s standard 4.0-liter V6 engine pumps out 270 horsepower and 278 lb.-ft. of torque. You won’t fall short of power, be it challenging grades or passing an 18-wheeler. And with its ability to tow up to 4,700 lbs., venturing into some of nature’s toughest ranges doesn’t mean you have to leave everything behind. 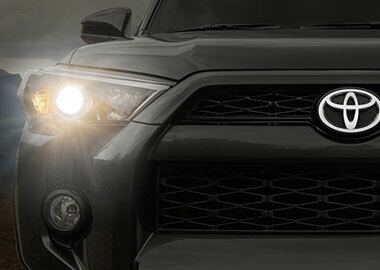 4Runner adheres to SAE J2807, the standard for tow ratings set by the Society of Automotive Engineers (SAE). The ventilated disc brake system cools things down to keep the brakes working the way they should, even when taking the long downhill drive back from that summit you've just explored. When you approach your 4Runner Limited with the Smart Key in your pocket, the interior and puddle lights illuminate automatically, the doors and rear liftgate open with the touch of a handle, and the engine starts with a push of a button. Getting the trip started is that easy. There's a soundtrack to every adventure. You won't miss a beat with 4Runner's standard Entune™ Audio Plus system: a 6.1-in high-resolution touch-screen display, AM/FM CD player with MP3/WMA playback capability, auxiliary audio jack and USB port19 with iPod®, connectivity. Navigation gives you turn-by-turn directions, HD predictive traffic and Doppler weather overlay — all straight from the 6.1-in. high-resolution touch-screen display. Toyota is devoted to safety and dependability, and proper vehicle maintenance is important to both. That's why we include a no cost maintenance plan with the purchase or lease of every new 4Runner for 2 years or 25,000 miles, whichever comes first. 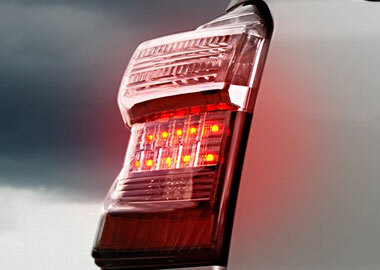 24-hour roadside assistance is also included for 2 years, regardless of mileage. With available Safety Connect®, emergency assistance is always within your reach. Via Toyota’s 24/7 call center, Safety Connect® offers subscribers helpful features such as Emergency Roadside Assistance, Stolen Vehicle Locator, Roadside Assistance and Automatic Collision Notification. 4Runner comes standard with the Star Safety System™, a suite of six safety features designed to keep you out of harm’s way. It includes Vehicle Stability Control (VSC), Traction Control (TRAC), Anti-lock Brake System (ABS), Brake Assist (BA), Electronic Brake-force Distribution (EBD) and Smart Stop Technology® (SST).